​At 7:00 PM local time tonight, the Philippine Lady Volcanoes Rugby Team, proudly backed by MVP Sports Foundation and First Pacific, will go head-to-head against hometown favorites Singapore for the Asia Rugby Women's Championship title. The Lady Volcanoes booked their place in the final after successfully defeating India 19 to 5 on Tuesday. On a positive side, the Philippines will field a full contingent of players, selecting their top 23 for tonight’s clash. Captain Aiumi Ono and Tanya Escala Bird have both been cleared for selection after each suffered minor injuries in Tuesday’s clash against the Indian team. The Lady Volcanoes will look to experienced players to ensure the Singaporeans are handled. Madille Salinas from Cebu expected to once again put her body on the line after some bruising defensive efforts which helped the Philippines maintain the Indian attack in their first match. Santos Knight Frank Mavericks representatives Rassiel Sales and Sylvia Tudoc will pair up together in the middle with some power forwards from Eagles RFC members Helena Indigne and Katrina Andrews up front. Off the substitution bench the likes of Makati Chiefs representative Eloisa Jordan from Cebu alongside Ada Milby of Eagles RFC to bring on the much needed impact when needed. Tuesday's debutant Agot Danton from the Davao Durians will once again also play a crucial role with the boot. Danton an experienced player with a football background continues to utilize her skills in an important role for the team. Her kicking skills will be tested tonight in front of a vocal home-ground and will be clinical to the Volcanoes success. 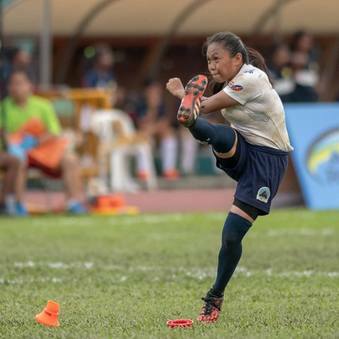 The Philippines are aiming for their first ever Division 1 title, a win will be major boost to the Women’s Rugby program.